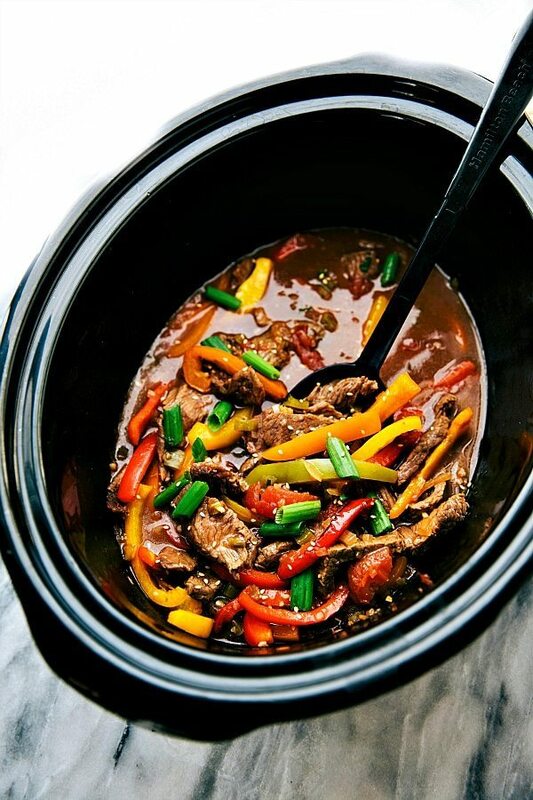 Delicious and simple pepper steak made in the slow cooker. 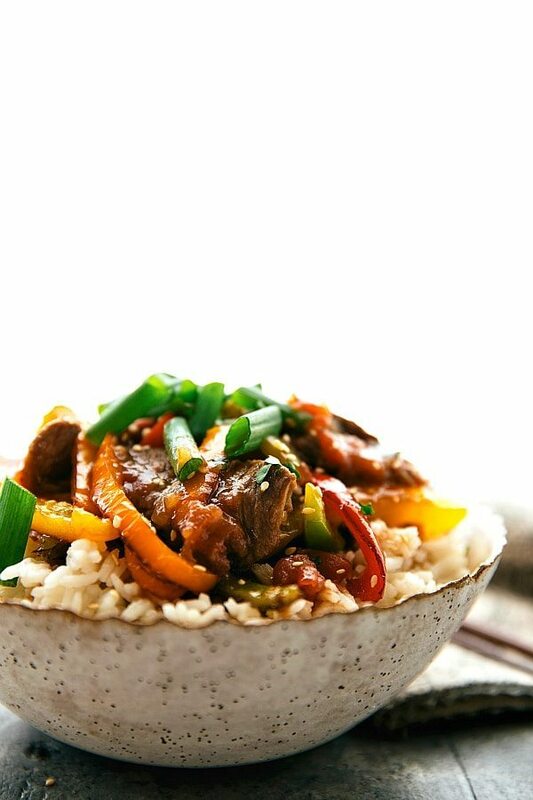 The steak and peppers become super tender after slow cooking all day! Aaaaaand I’m seriously considering re-naming this little website to “Chelsea’s Messy CROCKPOT.” Because, honestly, it’s constantly in use and constantly messy from being used. And if you are doubting there are enough crockpot recipes on my site to justify re-naming the blog, then be prepared because I’ve got about 3619150 more crockpot recipes coming at you. And no, I’m never prone to exaggeration. ? Okay so I am an exaggerator ?, BUT there really are quite a few more crockpot recipes I have on the docket and there are some really, really great ones that I can’t wait to share! This crockpot recipe today is a little different than most. In fact it’s the first recipe I’ve shared with cooking sirloin in a crockpot. And let me tell you right now — slow cooking sirloin all day long is incredibly delicious. The meat literally falls apart tender which is hard to get that kind of texture any other way. There are a few tips to making sure your meat does get that delicious tender in your crockpot. First is knowing your crockpot. What I mean by that is know if your crockpot runs hot or cold based off of recipe cooking times from recipes you’ve tried (did it finish faster or slower than indicated?). If it runs hot, the meat may cook way quicker and end up drying out instead of being super tender. Make sure you check on it often if you have a crockpot that tends to run hot or cook things quicker. The other thing that I’ve found: if the meat isn’t pretty covered with liquid, it tends to get a bit dry. So make sure to really stir the meat into the liquid and make sure it’s well covered. I’ll also stir it around a few times during the day just to ensure all the meat is staying nice and covered by liquid. It’s especially nice to have the meat all cut up and ready to go if you have to run somewhere in the morning. Sunday morning church — I’m talking about you! It’s perfect to just remove the meat from the marinade and pop it in the crockpot with the other ingredients. However, since this is a crockpot meal and aimed at being super simple, if you don’t want to marinade the meat it’s not going to be wildly different. 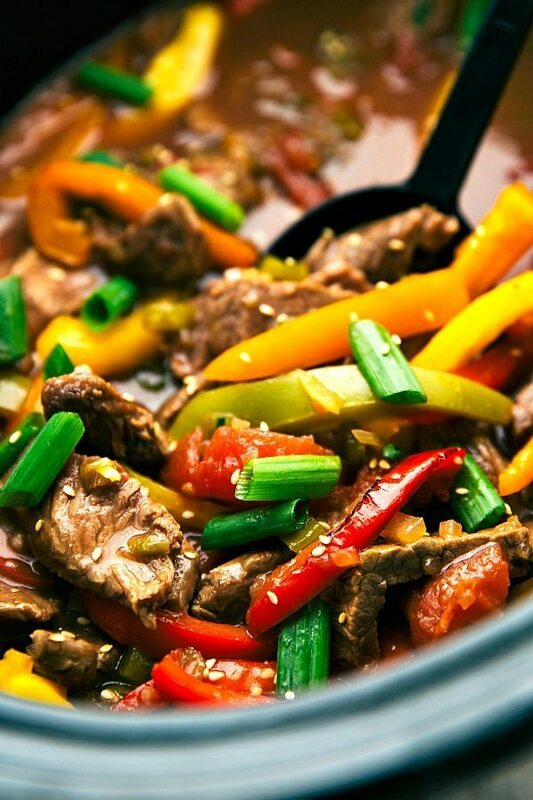 It’s still delicious, but you will have a more tender and flavorful meat by marinating it. Even 30 minutes will do something for it! If desired, marinade the meat. Remove the fat and cut the top sirloin into 2 inch strips. Place in a large sealable bag and shake or massage with the cornstarch, minced garlic, and baking soda. Add the soy sauce in the bag and shake to coat. Seal the bag and place in the fridge overnight or for a few hours. At the least, marinate for 30 minutes for an effect. Add the soy sauce, Worcestershire sauce, chopped green bell pepper, beef broth, minced garlic, cayenne pepper, and ground ginger. In a small bowl whisk with a fork the cornstarch and water together. While stirring constantly, add to the crockpot. About 2 hours before you are ready to eat, add in the bell peppers (stems and seeds removed and thinly sliced). Stir and cover again. This keeps them nice and "crisp tender" instead of getting mushy if added at the start. *I use one red, one yellow, and one orange but any variety will be great! Great recipe…love tips for making sure sirloin stays tender. Pinned. Just came across your site and my mouth won’t stop watering! Can’t wait to try your recipes! Thanks for sharing! Looks good. I was thinking of adding a drizzle of dark sesame oil to the marinade for just a little bit more of an Asian flavor profile. Sounds great! Hope you love this! Can I use a 4qt crock pot for this recipe? Absolutely delicious. 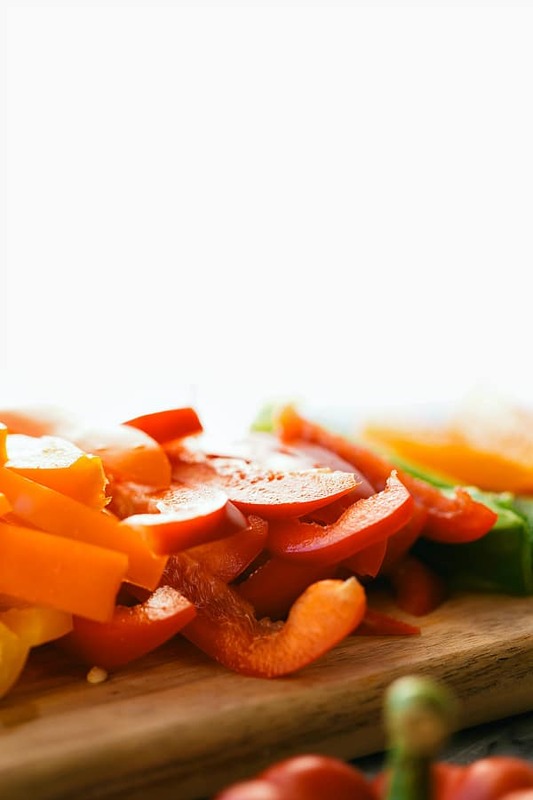 Agree putting peppers in later – makes them non-mushy. Thanks for sharing. Can’t wait to try this. It’s in my crock pot right now. I marinated the steak overnight (I’m using sirloin). Looks and smells delicious already. Thanks ? Thanks for this easy recipe Stacey. I am making it for a neighbor who is sick and I can tell it will be really tasty. I have the meat marinating now! Even the marinade smells great! Love using the crockpot when it is too hot out to use the oven. Totally agree! The crockpot is a life saver on hot summer days! Thank you Ann! Can you tell me how long to cook on high? 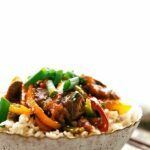 I know you don’t recommend it, buy my slow cooker has only one setting and this recipe looks too good to pass up! Hi Samantha! I hope you love this! I would say around 2-3 hours — just check it for doneness and try not to overcook it at all. Enjoy! do you have to use the stewed tomatoes? No, but you do need some sort of tomatoes and the liquid; you could do diced tomatoes. Can I use frozen onions and green peppers? Just for a quicker throw about 30/45 minutes before serving? I haven’t tried it, but I don’t see why not! 🙂 Enjoy! Why, oh why , can’t you people, when giving recipes give the size of the crockpot used???!!! Myself, using a lg. 6 qt. pot need to know if I need to double the recipe or not. Very few include this needed info. I use a 6-quart crockpot. Is there a length of time that is too long to marinade? Overnight can be a 6-9 hour on the average. Will it do ok if it marinades up to 24 hours? I know some meats become “chalky” when left in marinade too long. thank you – looking forward to trying this! oops – last question – I plan on doubling the meat so I assume I should double all other ingredients – correct? Yes that’s correct 🙂 And I wouldn’t marinate the meat longer than 8-10 hours. Enjoy! My only option was to marinade for about 12-14 hours. It turned out excellent! I have never liked sirloin in the crock pot because I could never get it tender. I am also not a huge pepper fan, but this was really a great recipe. I served it over caulifflower rice. Thank you for sharing. That’s so great to hear! Thanks for coming back and sharing 🙂 Glad it was a hit! Delicious!! Next time I’ll have to cut the recipe in half, because my hubby and I had it three nights in a row!! Lol Will definitely be making this again!